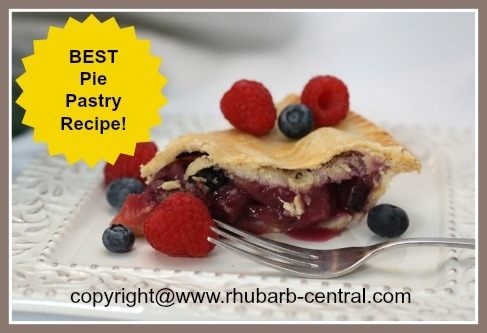 Here is the Pie Pastry Recipe that I always use ... 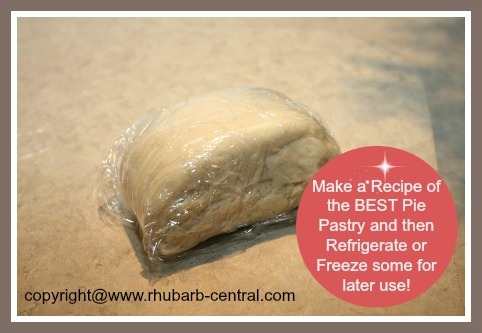 I consider it to make the BEST homemade, flaky pie pastry from scratch! In fact, it is the ONLY recipe for pie dough that I use. 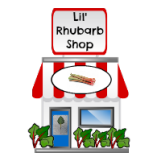 This recipe originated from the Pie Shoppe where my daughter used to work ... the recipe used for making hundreds and thousands of scrumptious pies of all types. This pie pastry recipe makes making pie dough a quick and easy experience. It has proven to be a "no fail" dough recipe that makes the most scrumptious and delectable homemade pies and tarts. Making Pie Pastry from "Scratch"
Note - the recipe below makes enough pie pastry dough for about 4 - 9" double-crust (top and bottom) pies, OR 8 single pie shells. 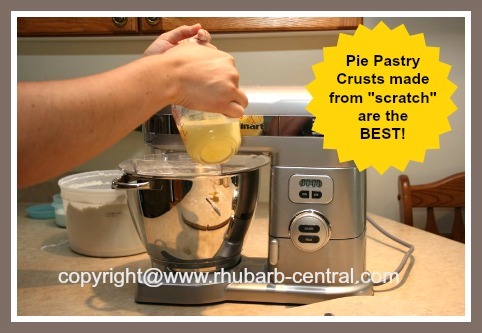 Stand Mixers Make Pie Pastry Making Easy! 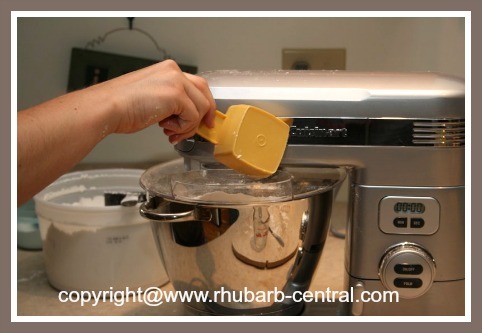 Combine the flour and the salt in a large bowl or the bowl of the automatic mixer. Cut the one pound of lard into small size cubes. Using a stand mixer, or a hand pastry blender, or two knives, cut in the lard mixture until the mixture resembles coarse oatmeal. 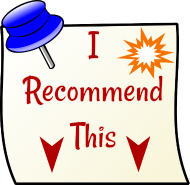 In a measuring cup, combine the egg and the vinegar, and add water to make 1 cup. 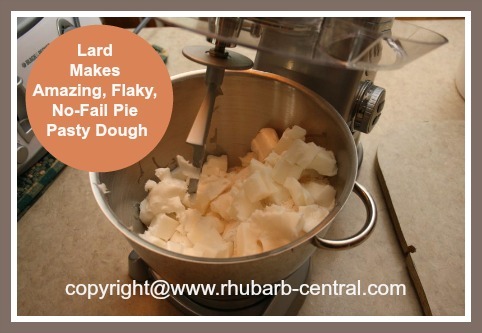 Gradually stir the liquid into the lard mixture, adding only enough liquid to make the dough cling together. Gather the dough into a ball, then into a log shape. 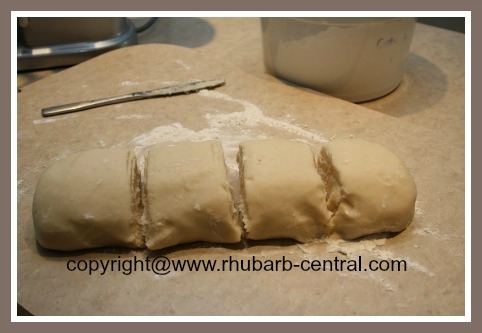 Divide the dough into four equal portions (see images). 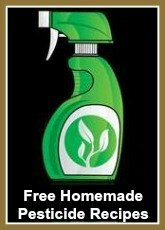 Use at once, or refrigerate or freeze until ready to use. To use pastry dough, roll out on a lightly floured surface. If the dough is "sticky", chill 1 - 2 hours before rolling. Transfer dough to pie plate or dish, and trim and flute shells or crusts. Bake according to your pie recipe directions.